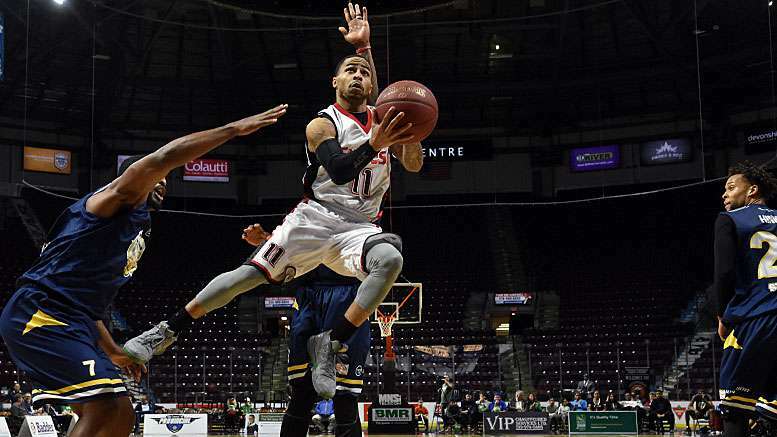 (WINDSOR, ON) – The Windsor Express were intent upon reversing their fortunes against the St John’s Edge at home. On three previous occasions the Edge left town with the W, but Windsor had a different plan in mind for head coach Bill Jones’ birthday. It was evident when Demontre Harris batted away an Edge attempt on an early possession. Then Maurice Jones knocked down a 3-pointer, picking up where he left off last night against Saint John, followed by a triple from Logan Stutz. Not to be left out of the game, Braylon Rayson dropped three under pressure from Alex Johnson. The Express, however, surrendered free trips to the line at a quickened pace, allowing St John’s to remain competitive. A fade by Shaquille Keith from the low post stretched Windsor’s early lead. The crowd was brought to its feet, not by the presence of Deputy Commissioner Audley Stephenson, but by a steal by Jones who converted it to a fast break jam by Stutz. Still, only 5 points separated the Edge and Express as the clock counted down to the 3 minute mark. Each team scored 5 points before the horn sounded with Windsor leading 22-17. St John’s started off the 2nd quarter with 4 points before Frazier dropped a trey and Brayson followed suit with a pair of 3-pointers. But the Edge continued to push forward and place the Express defense under pressure. St John’s managed to shave 2 points off the margin before Jones pulled down a rebound and sent Frazier for another breakaway layup. Frazier performed an encore with a triple from the top of the arc. Harris then set up Stutz in the paint just before the media timeout. Harris was on the receiving end of a dish from Rayson under the hoop for a two-handed slam, but had his pocket picked by Anthony Stover, a moment later. As the clock ticked down, Johnson put up a jumper to cut the Express lead to 47-39 at half time. Windsor played their strongest 3rd quarter of the season and wouldn’t let past ghosts get a foothold in the present. Keith was a clear and present threat during the period as he scored 11 points in just 8 minutes and out shined the Edge’s Carl English. Harris was solid on defense as he pulled down 2 rebounds made a key steal down the stretch. As a result, the Express extended their lead by a point to 9, and led 69-60 heading into the final frame. In the 4th, Johnson got the Edge back into the game with a pair of well placed triples. The crowd, again, however, rose as one when Frazier stole the ball and rolled a pass to Sefton Barrett who took it to the rim for two and a foul. The crowd was again on their feet moments later when Keith dropped a bomb from the side court to make it an 11-point spread. The Express competently moved the ball with purpose and continued to apply the pressure to the Edge. Each minute saw another point added to their margin until they were leading by 15 with 1:27 left to play. With a little over a minute to play, local product, Antoine Chandler and Mike Lussier entered the game for Windsor, much to the approval of the fans. Anthony Ottley Jr iced the cake for Windsor with a drive to complete the scoring. Lussier concurred with Chandler about the future prospects of the Express. When the horn ended the game, Windsor claimed a 108-95 victory and drew closer to the Edge in the standings. The Express (19-16) are 7-3 in their last 10 games with five regular season matches remaining. They’ll start with a Friday home tilt against Kitchener-Waterloo, who have been eliminated from the post-season and are just playing for pride. On Sunday Windsor hosts the 1st place London Lightning and will be looking to cover ground in the standings. Currently 3 games behind the front-runners, the Express are still mathematically able to overtake both London and St John’s, but can’t rely on other teams to do the work.